Removing Roof Stains-Louisville-Kentucky: So Your Roof is turning Black from Something growing up there! Now what do you do? Here you will find the truth about the proper way to have Black Streaks removed from your roof. Chosing a company that uses a Non-Pressure cleaning system is the ONLY correct choice for having your roof cleaned. Any type of pressure washing, even "low or reduced" pressure will damage your shingles resulting in early failure and high replacement costs. Qwik Roof Cleaners is the authority on non-Pressure Roof cleaning in Louisville Ky, and surrounding areas. quote from Qwik Roof Cleaners, Louisville Ky. So Your Roof is turning Black from Something growing up there! Now what do you do? You begin to notice some faint black streaks appearing on your roof top. At first it doesn't really look too bad, so you put it out of your mind. Foolish decision! Several months later you realize that whatever that stuff is, it is spreading like wildfire covering most if not all of the shingles. It now looks terrible and has lowered the value of your home by several thousand dollars, if not more. Now you have to make a decision on what to do to remedy this situation. If you are the handy man type, you will probably want to tackle this job yourself even though you don't really know what is involved. You begin with a search on the internet for products and techniques for removing this unwanted visitor from your homes roof. Great, you find several products that claim to work and are reasonably priced. Researching these products you learn that you may have to climb up on and walk around on the roof. Sorta scary, so you keep researching. You find a product that you can spray on the roof from the ground using your garden hose. Sounds safer. Then you read that this product may take up to 6 months to work fully. What!! 6 months to work! You got to be kidding me. Some other products need to be mixed in a pump up sprayer and applied. You start to imagine how many trips that is going to take up and down the ladder to cover the whole roof. Lots of opportunities to fall or damage the shingles by walking on them. Holy Crap! Maybe this doing it myself isn't such a good idea. You then start looking for companies that do roof cleaning. Searching the net you find numerous companies offering roof cleaning using many different techniques. Which one is the best and how do I know my roof won't be damaged? You find the Asphalt Roofing Manufacturers Association's website and it tells you never use any type of pressure washing equipment, even low or reduced pressure, on a asphalt shingle roof. The recommended way to clean asphalt shingles is to apply a non-pressure solution consisting of chlorine bleach and water. Ok, that decreases the number of companies to chose from to clean your roof since most were going to use a pressure washer with a big round surface cleaner attached, or some other kind of exotic solution that nobody knows what it consists of. In your search you find a professional roof cleaning forum, RCIA, and another imposter organization. You read some of the info available and become curious about the "Certified" roof cleaning professionals that are posting info on these sites. After clicking on some of the site links posted there, and looking at the "before and after" pictures you decide that this is the proper way to have your roof cleaned by certified professionals. After calling several companies, you learn that all "Certified Professional Roof Cleaners" carry insurance, provide guaranteed services and offer warranties and annual maintence programs so this dreaded growth will never again return to your home. You have made a very good decision and you are thrilled with the completed job because your roof looks like new and the property value has returned. This type of action is occurring everyday throughout the U.S. and many foreign countries. 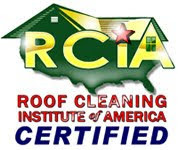 Hopefully many people will take the time to do some research such as above, and realize that the ONLY safe and through way to obtain a clean healthy roof is to have it cleaned by a Certified Roof Cleaning Professional Company such as Qwik Roof Cleaners, Louisville Kentucky or some other company certified by RCIA using non-pressure solutions. Certified Professional Roof Cleaner. Only RCIA certified professional in Louisville Ky.